Need a traditional gateway for that Oriental garden setting or an Asiatic village? we can help! 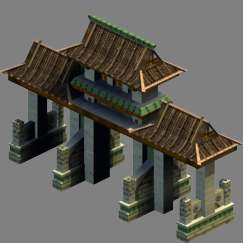 these Chinese-styled ceremonial arches should be able to add some atmosphere to whatever projects you’re doing, be it an environment or a game setting. (Click the thumbnails below to see the model from different persectives and to access the wireframe). Note: content offered below is linked to adf.ly-based advertising. Version 1.0 is not available for free download. V 1.0 Based off a blend of Chinese and southeast Asian influences. Poly count: 1,644 faces, 3,666 polys. Not available for this format. Another similar building of this type can be purchased at a cheap price from CGTrader. This page is currently being maintained by Beelim Solutions. All rights reserved. Any act of downloading and utilisation of materials offered and supplied through the hyperlinks of this page is allowed on a “fair use basis” in a manner that shall not be considered prejudicial to the interests, whether commercial or personal, of Beelim Solutions Ltd/Bhd and associated parties, nor deemed to be so by the same. Do not reproduce, duplicate, copy, sell, resell or exploit any materials offered on this page, or a part thereof, for any use without due permission. By clicking the above hyperlinks in this page you agree not to hold Beelim Solutions Ltd/Bhd, WordPress and Adf.ly liable of any injuries or damages arising from accessing said hyperlinks, or use or misuse of the products and services offered on this page. For further enquiries and comments, please either leave them on this page or insert a comment at http://modernity.wikia.com/wiki/User_talk:Beelim.